Offutt Air Force Base, Nebraska, U.S.
Joint Force Air Component Commander (JFACC), Barksdale AFB, LA – Conducts kinetic (nuclear and conventional) and non-kinetic effects planning and execution. JFACC manages global force air activities to assure allies and to deter and dissuade actions detrimental to the United States and its global interests; should deterrence fail, employs global strike air forces (bombers and ICBMs) in support of combatant commander. Joint Forces Maritime Component Commander (STRATCOM) (JFMCC), Naval Station Norfolk, Norfolk, VA - to conduct operations in the maritime envrionment for strategic deterrence. It is commanded by US Fleet Forces Command. Joint Force Space Component Commander (JFSCC), Peterson AFB, CO – JFSCC directs assigned and attached USSTRATCOM space forces providing tailored, responsive, theater and global space effects in support of national objectives. JFSCC executes operational command and control of space forces through the Combined Space Operations Center (CSpOC) at Vandenberg AFB. JFCC - Integrated Missile Defense (JFCC-IMD) Schriever AFB, CO – JFCC-IMD is constantly monitoring for any missile activity or threat against the United States and its allies. In the event of an attack, IMD plans and coordinates the necessary actions to counter the threat. When directed, also provides alternate missile defense execution support. Joint Warfare Analysis Center (JWAC) Dahlgren, VA – The Joint Warfare Analysis Center (JWAC) provides combatant commands, Joint Staff, and other customers with precise technical solutions in order to carry out the national security and military strategies of the United States. JWAC maintains and enhances its ability to conduct comprehensive technical analysis. U.S. Strategic Command's Airborne Command Post (ABNCP), also called "Looking Glass", allows USSTRATCOM the ability to command, control, and communicate with its nuclear forces should ground-based command centers become inoperable. USSTRATCOM was originally formed in 1992, as a successor to Strategic Air Command in response to the end of the Cold War and a new vision of nuclear warfare in U.S. defense policy. Department of Defense changes in command structure due to the "Goldwater-Nichols Act" of 1986, led to a single command responsible for all strategic nuclear weapons. As a result, USSTRATCOM’s principal mission was to deter military attack, and if deterrence failed, to counter with nuclear weapons. Throughout its history, it has drawn from important contributions from many different organizations stretching back to World War II. Providing national leadership with a single command responsible for all strategic nuclear forces, General George Butler, in establishing the new command, borrowed from the work of General Curtis LeMay, an early commander of Strategic Air Command. LeMay was a very vocal advocate for a strong national defense, particularly as regards nuclear weapons. Being a Unified Command, another major concern for Gen. Butler was interservice rivalry, having soldiers, sailors, airmen and marines in one command. There had been decades of rivalry between the branches of the U.S. military regarding control of nuclear weapons. Even though a compromise had established the Joint Strategic Target Planning Staff, there were systemic and institutional problems that could not be overcome. USSTRATCOM was re-structured October 1, 2002 by Secretary of Defense, Donald Rumsfeld. It was now to merge with the United States Space Command and assume all duties for full-spectrum global strike, operational space support, integrated missile defense, and global Command, Control, Communications, Computers, Intelligence, Surveillance and Reconnaissance (C4ISR) and specialized planning. Its duties now include intelligence and cyber support as well as monitoring orbiting satellites and space debris. USSTRATCOM also supported United States Africa Command's 2011 military intervention in Libya in a variety of ways, including long-range conventional strikes and intelligence, surveillance and reconnaissance (ISR). An intention by the U.S. Air Force to create a 'cyber command' was announced in October 2006. On May 21, 2010, part of USSTRATCOM's responsibility regarding cyber-warfare operations was spun off into a 10th Unified Command, the United States Cyber Command. As a result, USSTRATCOM's Joint Task Force-Global Network Operations (JTF-GNO) and Joint Functional Component Command – Network Warfare (JFCC-NW) were disestablished. ^ a b c d e f g h i j k l m n o p "Command Snapshot". www.stratcom.mil. ^ "US Fleet Forces Commander Designated as NAVSTRAT, JFMCC STRAT". stratcom.mil. Retrieved 26 March 2019. ^ "Joint Warfare Analysis Center". jwac.mil. Retrieved 20 December 2018. ^ ""MARFORSTRAT - Headquarters."". stratcom.mil. Archived from the original on 17 February 2013. Retrieved 6 March 2013. ^ "U.S. Strategic Command Service Components". stratcom.mil. Archived from the original on 13 November 2013. Retrieved 13 November 2013. ^ "E-6B Airborne Command Post (ABNCP)". stratcom.mil. ^ a b W. Spencer Johnson (2002). "New Challenges for the Unified Command Plan" (PDF). www.dtic.mil. Archived from the original (PDF) on 17 October 2005. Retrieved 30 July 2018. ^ a b "USSTRATCOM Celebrates 15 Years". www.stratcom.mil. USSTRATCOM Public Affairs. 25 September 2017. Retrieved 29 July 2018. ^ a b c Rita Clark (LtCol, USAFR); Dr. Vincent Giroux, Jr.; Dr. Todd White (15 August 2013). History of the United States Strategic Command (USSTRATCOM) - Nuclear Weapons, Cold War Strategy, Service Rivalries, Arms Control. Progressive Management. ISBN 978-1-30-101083-7. ^ "History". US Strategic Command. January 2018. Retrieved 29 July 2018. In addition to the dramatic changes in the global landscape associated with the end of the Cold War, changes in the structure of the DoD stemming from the 1986 "Goldwater-Nichols Act" led national leaders to favor a single command responsible for all strategic nuclear forces. 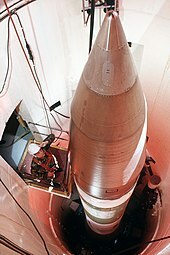 The new command's principal mission was to deter military attack, especially nuclear attack, on the United States and its allies and, if deterrence failed, to employ nuclear forces. ^ U.S. Strategic Command Public Affairs (1 February 2010). "USSTRATCOM Comments on Space Debris Article". www.stratcom.mil. Retrieved 30 July 2018. ^ "History". US Strategic Command. January 2018. Retrieved 29 July 2018. In 2011, it supported U.S. Africa Command's operations against Libya in a variety of ways, including long-range conventional strikes and ISR. ^ John C.K. Daly (9 October 2006). "US Air Force Prepares For Cyber Warfare". Space Daily. Retrieved 30 July 2018. Wikimedia Commons has media related to United States Strategic Command.